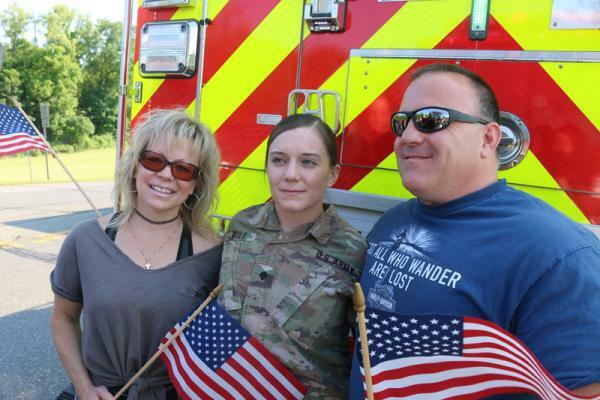 A Palenville woman who has been serving in Afghanistan with the U.S. Army received a warm welcome from first responders and family Wednesday. Fire trucks from the Catskill, Leeds and Palenville fire departments and officers from the Greene County Sheriff’s Office, state police and Catskill police lined up along the highway leading up to the New York State Thruway to wait for Morgan Voulo to return home from a tour of duty in Afghanistan. Voulo, an E4 specialist, returned after a nine-month tour and will not deployed again for another two years, she said. Voulo was surprised and touched by the welcome. Voulo’s mother, Denise Morgan-Sulkey, is ecstatic about her daughter’s return. Morgan-Sulkey was worried for her daughter’s safety in Afghanistan because of the sudden eruptions of violence occurring in the country, she said. Morgan-Sulkey spoke to some of her friends prior to Voulo’s return and they asked Morgan-Sulkey if she could tell them when Voulo was scheduled to arrive, so they could have a special homecoming celebration for her. Morgan-Sulkey and Voulo are looking forward to spend some time together and have planned a mother/daughter spa day, Morgan-Sulkey said. “She asked me ahead of time,” Morgan-Sulkey said of having a spa day. Greene County Tourism Marketing Manager Heather Bagshaw was initially made aware of Voulo’s return from service last week. Morgan-Sulkey texted Bagshaw on Wednesday morning to tell her that her daughter would be landing at 3:30 p.m. and getting into Leeds at around 5 p.m.
Bagshaw had a conversation with Catskill Fire Department Assistant Chief Patrick McCulloch after the homecoming when he told her that the department has done 10 homecomings for soldiers in the past. Bagshaw was grateful that Voulo made it home safe and said it was great to be part of the welcoming ceremony.